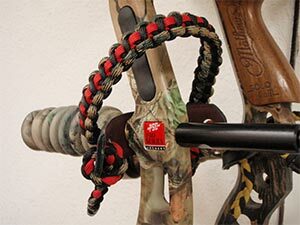 A bow wrist sling will give an archery two distinct advantages over those who choose not to use one. Read how using a bow sling will improve your accuracy by preventing bow jump and helping to give your bow a rock solid platform. Everyone who shoots a bow seems to have accuracy issues. Is this one of your problems? If you don't have a wrist sling mounted on your bow you should seriously consider getting one. I highly recommend the type that is braided out of paracord. They are narrow, and don't stretch. A bow wrist strap will as I mentioned increase your accuracy. You want to tighten those groups... right? The strap will when adjusted correctly prevent bow jump. The best way to hold your bow is with the grip of the riser going across the meaty part of your palm... no... not on the lifeline but closer towards your thumb. The thick meaty section. While holding your bow at full draw open your fingers and allow them to be relaxed... no death grip on the bow. As a matter of fact I shoot with my fingers away from the grip, so as to prevent any twist. If you grip your riser you will most certainly twist the bow. Once fired the wrist strap will "catch" your bow and prevent it from falling. The second advantage to the wrist sling is when adjusted correctly will help to give you that rock solid platform needed to shoot arrows accurately. How is that? The proper adjustment should have the sling snug against the back of your wrist when at full draw. This will ensure you bow remains steady and seated correctly in the palm of your hand. I have a connection to get custom made wrist straps made just like the one pictured; made in the USA to your exact color request. If you are interested in getting one, use the contact us form and I can arrange the connection for you.